By booking on line you have agreed to our terms and conditions. 48 hours notice of cancellation must be given otherwise a full charge for hire will apply. Children under 16 must be supervised at all times by an adult in the arena. No rider under 8 will be permitted to use the cross country course unless participating in an affiliated Pony Club event. An adult with a working mobile phone must always be in attendance when the course is in use. All lone riders must carry a working mobile phone. All riders MUST wear a hat to the standard of ASTMF1163 or PAS 015 at all times when mounted. Body protectors are recommended. All riders are required to wear suitable footwear with defined heels. All fences must be returned to approximately 90cm/1m and left the way they were found. All droppings must be removed from the arena, xc loops and the parking areas as soon as they are done. If you did not wish this data to be saved please inform us and we will us an alias. To protect client data we use double authentication, our tablets and P.C’s have auto screen lock etc. In case of a system break in we will inform you as soon as we have informed the police. If you are concerned about the way your data has been saved or used please let us know. We do not hold any personal information. Neither the owners or the tenants or any persons acting on their behalf accept any liability for any loss, damage, accident, injury or illness to horses, riders, spectators or any other person's property whatsoever. Equestrian pursuits are inherently dangerous and can result in serious injury and therefore using Wickstead Horseplay arena and facilities is entirely at your own risk. 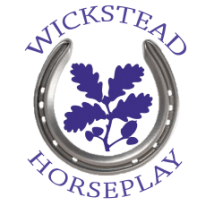 Wickstead HorsePlay has the right to cancel any booking without notice. Each competition will have it's own Terms and Conditions on the Entry Schedule.